In stock. Order in the next 12 hours, 4 minutes and it will go out today! 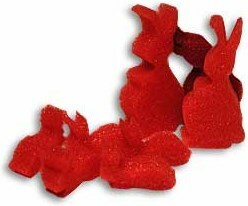 Two small (2.5 inches tall) sponge rabbits are displayed. "Mama" rabbit is placed into a spectator's hand, and "Papa" rabbit is placed in the magician's pocket. Somehow, the Papa rabbit jumps into the spectator's hand! The two bunnies are placed back into the spectator's hand, and when she opens her hand and whole family jumps out!